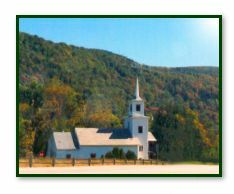 Our Lady of the Mountains Roman Catholic Church in Killington, VT shares the little white church with the United Church of Christ. The little white church is located at the bottom of the hill on Route 4. Continue East on Route 4 for 1.8 miles past the intersection of Route 4 with Killington Road and the Welcome Center and look for the church steeple on the left. If you pass Goodro Lumber, you"ve gone too far. Continue West on Route 4 for 3.3 miles past the Killington Skyship Gondola. The church is just past Goodro Lumber Company, just a short distance up the hill, on the right. Holy Days of Obligation: Service schedules will be posted here as they are needed; most Masses will be in Rutland or Woodstock. OLM functions due to the help and efforts of all its members - visitors and residents alike - any help, financial or physical, that you may wish to give is appreciated.